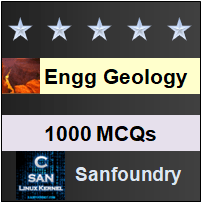 This set of Engineering Geology Multiple Choice Questions & Answers (MCQs) focuses on “Composition and Texture of Igneous Rocks – 01”. 1. Pick the option which does not determine the texture of igneous rocks. Explanation: The term texture is defined as the mutual relationship of different mineralogical constituents in a rock. It is determined by the size, shape and arrangement of these constituents within the body of the rock. 2. Which of the following is not a factor explaining texture? Explanation: The following three factors will primarily define the type of texture in a given igneous rock: Degree of crystallization, Granularity and Fabric. Explanation: Holohyaline is the term used, when, all the constituents are very fine in size and glassy or non-crystalline in nature. 4. What is the term used when constituents are crystallized completely? Explanation: Holocrystalline is the term used when all the constituent minerals are distinctly crystallized. 5. What is the range of grain size for coarse grained igneous rock? Explanation: When the average grain size is above 5 mm; the constituent minerals are then easily identified with naked eye. These rocks are termed as coarse-grained rock. Explanation: When the average grain size lies between 5 mm to 1 mm it is termed as medium grained. Use of magnifying lens often becomes necessary for identifying all the constituent mineral components. Explanation: When the average grain size is less than 1 mm it is termed as fine grain. In such rocks, identification of the constituent mineral grains is possible only with the help of microscope for which very thin rock sections have to be prepared. 8. What is the term given when some granules are exceptionally large and few are small? Explanation: The texture is termed as equigranular when all the component minerals are of approximately equal dimensions and as inequigranular when some minerals in the rock are exceptionally larger or smaller than the other. 9. Pick the wrong statement about granitic texture. Explanation: In the granitic texture, the constituents are either all coarse grained or all medium grained and the crystals show euhedral to subhedral outlines. Explanation: All those textures in which majority of constituent crystals of a rock are broadly equal in size are described as equigranular textures. There are 3 types- Granitic, Felsitic and Orthophyric.